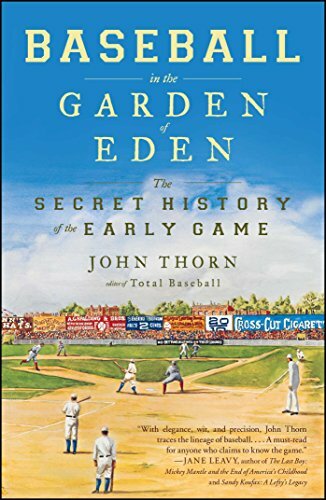 Reputed baseball historian John Thorn has not only been named Major League Baseball’s Official Historian in 2010, in his new book Baseball in the Garden of Eden: The Secret History of the Early Game, he penned the ultimate story of the origin of our national pastime. Forget the myth of Abner Doubleday as the game’s originator. Mr. Thorn dispels the story of the birth of baseball through meticulous and thorough research. If you are a fan of baseball history, you won’t be disappointed when you’re reading this true account. Names like Daniel Lucius Adams, William Rufus Wheaton, and Louis Fenn Wadsworth come into clearer focus when discussing the true originators of baseball. Mr. Thorn makes an argument that each man has a stronger claim as the “Father(s) of Baseball” and that creation was not based on the idea of inspiring young people to primarily engage in a pure activity to promote physical fitness. Rather, Mr. Thorn spells out that baseball really caught on when gamblers started to wager on the results. This created an environment in which the game evolved because people were interested in not only supporting their hometown team but also winning some money on the side. Is it any wonder then that today’s rules on gambling are some of the most stringent in all of sports? Mr. Thorn points out the game of baseball almost died before it even really came of age because of gambler involvement. Baseball in the Garden of Eden: The Secret History of the Early Game is a must read for any true historian of baseball. The religion of baseball and its origins are spelled out as meticulously in Mr. Thorn’s book as the Holy Bible spells out the story of Eden and the creation theory in the book of Genesis.